The first English settlements appeared on Barbados in 1627 and the British started growing sugar cane. Soon many slaves were brought to work on the plantations, thus population of the island quickly grew. Slavery was abolished in 1834, but for a long time the majority of the population didn't have any rights to influence the local policy. During the 1930s the descendants of the slaves started struggle for equal political rights and by 1949 they managed to seize the power from the planters. 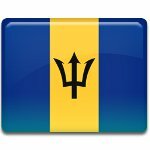 From 1958 to 1962 Barbados was one of the members of the West Indies Federation. After its dissolution the island reverted to its former status of a self-governing colony. The first negotiations towards independence of Barbados were started in June 1966. Eventually the island was granted independence on November 30, 1966.